Our regular lunch meeting on Mon, 15 April 2013 was conducted by IPP Mavis as President Chee Kan was away. As usual it was choke full of activities and announcements. We had the pleasure of visiting Rotarian from Sri Lanka and our good friend & regular visitor PDG Willy from Indonesia. PP Terry brought along his old school mate Mike who now lives in Miami, Florida. PE Dr Hans took the opportunity to make early announcements on the upcoming 40th Installation Dinner on Sat, 22 June - mark that date down. He also gave a final update on our Major Project. 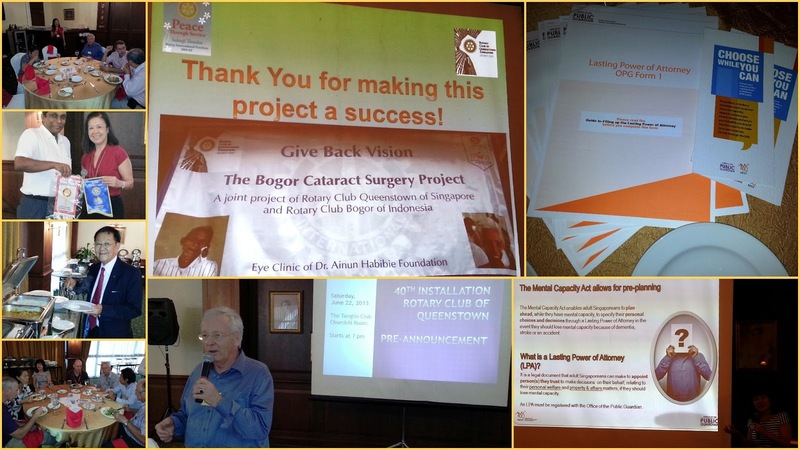 We set out to provide Cataract Surgery for 85 poor and elderly in Bogor, Indonesia. Thanks to excellent support from so many friends and Rotarians we managed to exceed the number and helped 100 patients. The highlight of lunch was the presentation by Guest Speaker Ms Laura Chua from Ministry of Social and Family Services who gave an excellent insight into the newly enacted legislation on Lasting Power of Attorney. Questions and queries were plenty as many have direct stake in this issue. You cannot wait till you lose your mind - CHOOSE WHILE YOU CAN! Finally don't forget that RCQ Happy Hour is just days away - Contact PP Eric Chan now to spice up your evening on Thursday!